Renting in New York City: What will $2,500 get you? We've rounded up the latest rental listings via rental site Zumper to get a sense of what to expect when it comes to finding a rental in New York City if you're on a budget of $2,500/month. Listed at $2,500/month, this studio apartment is located at Seventh Avenue and West 13th Street. The building features on-site laundry and an elevator. In the unit, expect high ceilings, large windows, a dishwasher, hardwood floors and extra storage space. Luckily for pet owners, both dogs and cats are welcome. According to Walk Score's assessment, this location has excellent walkability, is very bikeable and is a haven for transit riders. Next, there's this one-bedroom, one-bathroom apartment situated at 203 E. 38th St. It's also listed for $2,500/month. When it comes to building amenities, expect on-site laundry, a roof deck and an elevator. In the unit, you are promised a stove, hardwood floors, high ceilings, wooden cabinetry and ample natural light. Sorry pet owners: neither cats nor dogs are welcome here. Walk Score indicates that the surrounding area is a "walker's paradise," is very bikeable and has excellent transit. Here's a studio apartment at Lexington Avenue and East 55th Street that's going for $2,500/month. The unit features hardwood floors, high ceilings, recessed lighting, wooden cabinetry and storage space. When it comes to building amenities, anticipate on-site laundry, outdoor space and an elevator. Pet owners, inquire elsewhere: this spot doesn't allow cats or dogs. 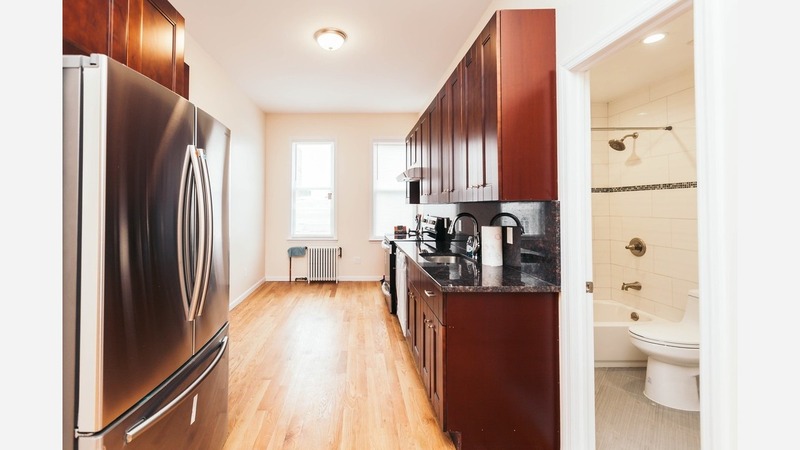 Next, check out this studio apartment that's located at 134 Wilson Ave. It's listed for $2,500/month. Apartment amenities include hardwood floors, high ceilings, closet space, granite countertops, stainless steel appliances and a dishwasher. Unfortunately for pet owners, animals are not permitted. According to Walk Score's assessment, the surrounding area is extremely walkable, is very bikeable and is a haven for transit riders. Located at 27 Arion Place, here's a studio apartment that's listed for $2,500/month. The building has on-site laundry, outdoor space, a fitness center, a roof deck, storage space and a residents lounge. The apartment features hardwood floors, high ceilings, wooden cabinetry, exposed brick and large windows. Luckily for pet owners, both dogs and cats are permitted at this property. Per Walk Score ratings, this location has excellent walkability, is quite bikeable and is a haven for transit riders.